Framed photograph, 12” x 6” (sight) in a matted frame, VG. 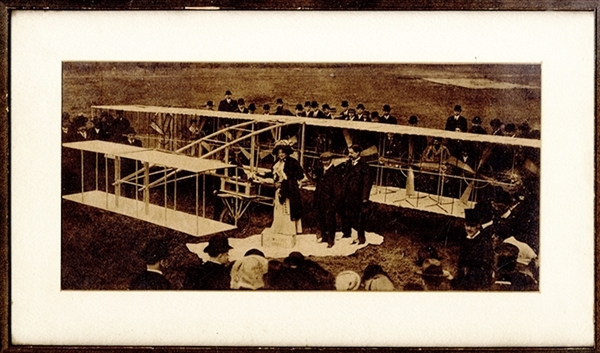 The image shows Wilbur R. Kimball's aeroplane “New York No.1” at Morris Park, New York, during its christening by the well-known Ziegfield Follies showgirl Anna Held (common-law wife of Ziegfield), on March 12, 1909. Standing with Held are Wilbur R. Kimball and Glenn Curtiss. Here’s what the May 19, 1909 edition of the New York Times newspaper had to say about Kimball’s flight attempt on May 18, 1909. ‘Wilbur R. Kimball’s new eight-propeller aeroplane gave evidence of being a real bird of flight yesterday …… something went wrong with the steering gear, and instead of keeping in the middle of the roadway the aeroplane skidded over the two or three foot bank bordering the track, finally stopping in a damaged condition.’ The image has an overall reddish tone and is somewhat dark. Still a very important event in early flight. With eight 4-bladed propellers driven by one engine. The big machine was built at Morris Park under the direction of the American Aeronautic Society but appears not to have flown with any great success.